Here's how to spend your time in Budapest! “You’re gonna love this city. It’s amazing!” said my Airbnb host as they gave me the colourful “City Spy” map of Budapest, featuring recommended vintage shops, restaurants and must-see places. It also included some useful phrases in Hungarian, thanks to which I learnt how to say: “Yes, it smells like fish” and “My bum hurts”. Let me begin with some basic but useful information. Budapest, the capital and biggest city in Hungary, had its beginnings in around 1 AD. Since then the city has gone through the Middle Ages, the Turkish occupation, the Habsburg administration, the damage caused by WWII, and a Communist regime. Now it is a global city, a centre for culture, science and tourism, despite its controversial Hungarian politics. The River Danube divides the Hungarian capital. Budapest was created with the connection of Buda and Óbuda on the left side of the river and Pest on the right. These sides of Budapest are joined by bridges, and the two most worth seeing are the Chain Bridge (Széchenyi Lánchíd) and Liberty Bridge (Szabadság híd). You can get around the city by bus, or an old photogenic tram, or by the underground of which the first line was built in the late nineteenth century. You can also experience the old days in one of Budapest’s trolleybuses. Spot the Ikarus! But walking is probably best as most of the places you will want to visit are close to each other. Budapest is full of hostels and hotels with price ranges for everyone. I personally recommend Airbnb, as I found one on a quiet street in an old building with a lift from the turn of the century. As I mentioned money, let me remind you that even though the exchange rate is good it is easy to spend too much money. Trust me. As for specific places to visit? Let’s start with Buda’s side of the Danube. 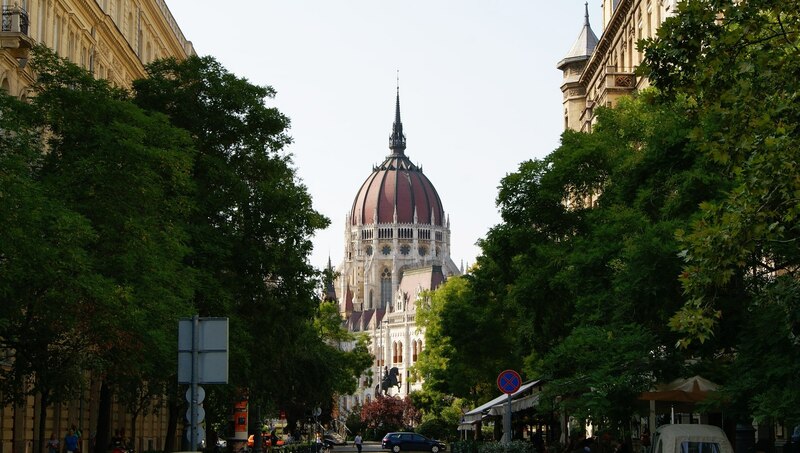 Firstly, Castle Hill with the magnificent Fisherman’s Bastion and Matthias Church, surrounded by adorable streets, and then obviously the Buda Castle with National Art Gallery, museums and National Széchényi Library. You should also visit Gellért Hill with its Citadel. All these incredible buildings tower above the city. You will take the best pictures of the Parliament of Budapest from Buda: simply go to Batthyány Square (Batthyány tér). In the middle of the Danube, there’s Margaret Island: perfect for an afternoon stroll. Although Buda is greener than Pest, you will see and visit more places in Pest. Probably the best panoramic view of the city is from St. Stephen’s Basilica, in Pest, which is worth visiting. As you’ll be near the Basilica, go to Anjuna for delicious vegan ice pops. It is hard to miss Anjuna as they have a beautiful (and Instagrammable) window display. From Anjuna, go along Andrássy Avenue (Andrássy út), Budapest’s most representative street. You’ll find restaurants where you can try lángos, as well as Chanel and Gucci and the 360 Bar with a rooftop view of the city. Don’t miss the Hungarian State Opera House just nearby! At the end of Andrássy út you will find City Park with its Heroes’ Square, Zoo, Vajdahunyad Castle and “Egg Timer”, one of the biggest hourglasses in the world. Exciting, right? You should also make time for the Hungarian National Museum, one of the markets, and of course visit one of Budapest’s baths! Probably the most exciting part of Budapest is the historic Jewish District which includes The Great Synagogue Museum. But a touch of history is only one of the attractions. Go to one of the vintage shops in the Jewish District which includes Retrock and Szputnyik, or Printa and MONO for art and design lovers. Or visit one of the pubs or clubs: Szimpla Kert, a pub in ruins, is a must-visit. Budapest will also satisfy book-lovers. There is a bookstore in Mai Manó Gallery, which is old and interesting. Bestsellers Kft are another option, as is my favourite bookstore Massolit Books and Café, where you can buy books (even English translations of the greatest Polish ones) or just grab one of them and read while sipping coffee. If you walk down Múzeum Krt you can visit one of many antiquarian bookshops, especially Központi Antikvárium which sells manuscripts and periodicals. Too expensive for us, but still nice to look at. Film lovers should visit one of the old cinemas such as Urania, Művész or Puskin. To pretend you can understand modern art, go to the Ludwig Museum. To improve your Instagram game, go to the Museum of Applied Arts which is wonderfully designed inside. If you’re an architect-lover, look at one of the libraries like the Metropolitan Ervin Szabó Library. For a less traditional museum, go to Zwack Unicum Museum which has a tasting session for its liqueur included with the ticket price. Fancy a selfie? Find a statue. Columbo, Marx or Ronald Reagan? Catch them all! Walk around the city, especially the Jewish District, to spot amazing street art. You can also visit the Michael Jackson Memorial Tree on Erzsébet Square (Erzsébet tér). Don’t forget to try traditional Hungarian cuisine, such as lángos (fried dough with toppings), goulash, kürtőskalács (chimney cake), meggyleves (sour cherry soup) and many, many more. And, of course, remember to drink Tokaj wine. To try something else go to Karavan, an alley with funky food trucks. Or go to Market BDPST for the best vegetarian burger ever. But meat lovers will find there many options for themselves too. For a cheap but tasty lunch, go to Duran Sandwiches. For souvenirs visit any gallery. There are beautifully designed postcards and posters in the same style. Don’t bother buying souvenirs at the airport. I saw cheaper alcohol at an airport on the Canary Islands. Besides that, I have no idea what could be stopping you from going to Budapest! Where else can you walk around and make bad puns of The Grand Budapest Hotel?